What is Online Lead Management Software? Online Lead Management Software helps a company focus on getting the most from their lead generation techniques and identifying leads which will conform to the purpose designated by the company’s overall business objectives. The Lead Management Software here is offered under the SaaS (Software as a Service) model, meaning that the software is web based, hosted on the Cloud and can be accessed when needed through a client or web browser. If you’re looking for similar online software like Lead Management Software, consider our Sales Automation or Sales Management Software categories. Lead Management Customized Just for You! Simple, straightforward and intuitive to use. 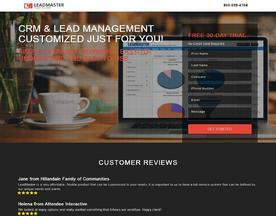 With LeadMaster it's easy to manage contacts and stay on top of your leads - from any computer, tablet or phone. No more hunting for contact info, notes or emails because everything is available from one page.